There is a saying that ‘engineers save more lives than doctors’; in terms of sanitation alone, this is probably historically true, but increasingly doctors and engineers are working together to come up with many potentially life-saving solutions. This is just as well because, according to the World Health Organisation, the rise of antimicrobial resistance (AMR) is a global health crisis. Drug-resistant infections could kill an extra 10 million people across the world every year by 2050 if they are not tackled. Michael Phillips, Design Development Director for Renfrew Group, believes the first step is to increase funding. There is little financial incentive for pharmaceutical companies to develop new antibiotics, hence O’Neill’s proposed AMR Innovation fund. The first step is to use some of this funding in technologies that support the development and use of antimicrobials. The proposition as it stands is that the pharmaceutical sector globally contributes US$0.4bn to an innovation fund to promote the discovery of new antibiotics. Where should this fund be spent? One particular cause for public concern in recent years has been the hospital environment and questions are asked about whether it can be improved to help reduce the spread of infection. For example, Clostridium difficile (C. diff) and Norovirus can, among other symptoms, induce severe vomiting and can result in spores being projected up to eight metres away. In such a scenario, would closing the curtains round the bed be considered effective enough for patients in the neighbouring beds? In the UK, it is estimated that Healthcare acquired infections (HCAIs) affect some 100,000 patients a year and are responsible for the deaths of around 5,000 patients annually in the UK. The recommendation is that someone showing signs of an HCAI should be isolated immediately to a side room, with its own basin and toilet, but a report by thinktank ResPublica2indicated a shortfall of 37,000 of such rooms in the NHS. Some 600 frontline NHS staff were asked by the NHS Institute for Innovation and Improvement, if they were given a ‘technology magic wand’, what would they want to best help combat infection in hospitals? 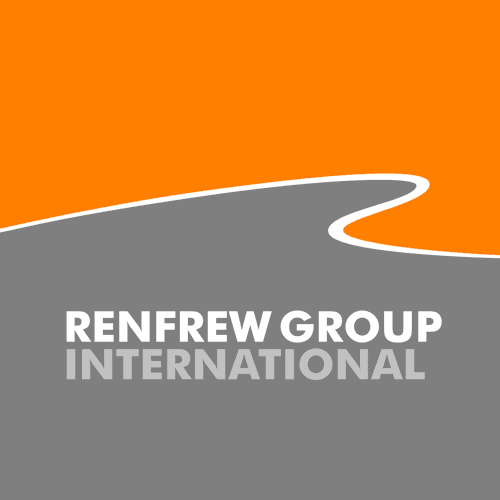 Product design company Renfrew Group assisted the steering committee with the process of visualising and assessing the early ideas, and developed concepts for 10 technologies. Several were brought together in the form of a portable isolation facility, called the Temporary Side Room (TSR), for use on the ward. Solutions investigated included tent-like structures with clear plastic walls and roof, and fabric and mesh. ‘The target was something that would improve upon current cross infection rates as much as possible, while being practical to manufacture and install and that must be comfortable to live in,’ said Phillips. ‘It must not look intimidating or feel claustrophobic.’ The requirements were that it must be practical, fast to erect and dismantle and easy to clean with no dirt traps. Other features included a non-touch doorway, hand washing facilities and built-in water supply for a minimum of one day’s washing with non-touch towel dispenser as well as a two-sided consumables locker and a deliveries hatch. 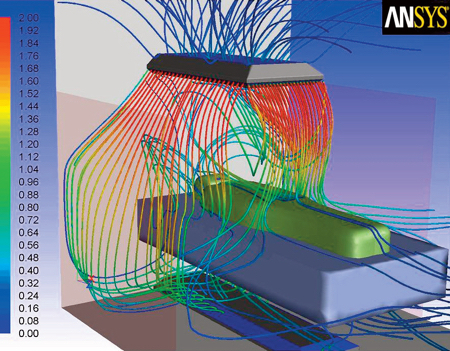 Design tools such as computational fluid dynamics (CFD), in this case from Ansys, were used as well as quick rigs filled with smoke. ‘We looked at how to make a doorway that produced a nominal negative pressure, to try to retain as much of the airborne pathogen as possible,’ said Phillips. 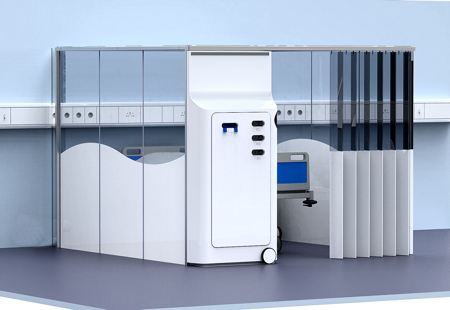 Working with the NHS nationally, the National Innovation Centre and the Department of Health, as well as widely with industry, Renfrew created designs and prototypes for a TSR that could be erected and dismantled within an hour, in situ and without disturbing the infrastructure. Prototypes were tested at the Health Protection Agency (HPA), Porton Down with the use of special markers and live bacteria. Ten units were made for trials to explore the practical use in a clinical environment, and these trials were run at University College London Hospital (UCLH) in 2011. It turned out that a key thing was access to hand washing facilities. Phillips said: ‘We engineered a system that would deliver 50 to 70 handwashes. ‘Also vital to a comfortable environment is a breathable roof. This provides a surface, close to the head when standing, that does not reflect heat or importantly sound,’ added Phillips. During the process of designing the TSR, the question was asked, could this infection control capability be achieved without solid walls? 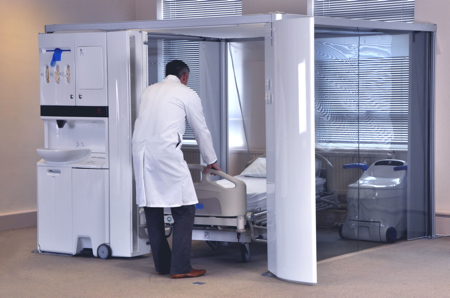 A portable air curtain could provide a degree of infectious particle containment in an easy to move and install package, and claustrophobia of patient would be minimised. So Renfrew started to work on a design. CFD was again the main tool in the design team’s armoury at this stage. Phillips said: ‘By entraining downward airflow from overhead air blades, and evacuating at a higher volume (slower speed) under the bed, we could remove the particles. A solid or impermeable roof makes an uncomfortable space where heat and sound is reflected back, whereas a good acoustic profile provides a comfortable, non claustrophobic atmosphere. A 50 micron mesh was found to provide a balance between keeping the majority of particles in, while making the difference between a pleasant and an unacceptable living space.